Target your delivery bottlenecks. Find them quickly by taking our short DevOps survey. Wondering where to start with DevOps? DevOps is an enterprise capability that spans all stakeholders in an organization, including business owners, architecture, design, development, quality assurance, operations, security, partners and suppliers. 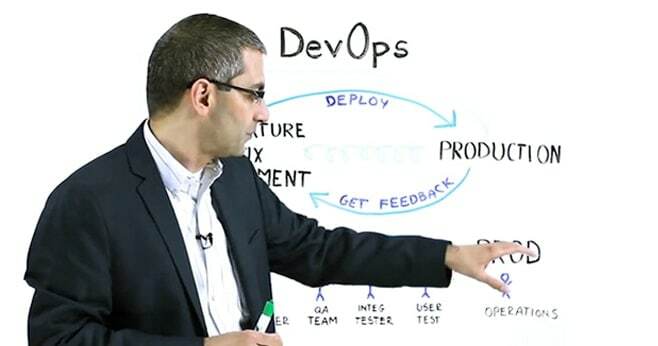 Getting started with DevOps includes creating the right culture, identifying business challenges and finding bottlenecks to eliminate within the delivery pipeline. Watch the video to learn more. Know where to start but need more help? The IBM Cloud Garage Method breaks down DevOps into everything your development, testing and operations teams need. It includes how-to guides on culture, best practices, tools, self-guided or hands-on training, and even sample code and architectures. See how the Garage Method can help turn your organization from a slow set of siloed teams to a self-managing, solution-oriented, bottleneck-free, go-fast team! See how you can rapidly develop, test and run your first app in 30 minutes! Continuous testing helps reduce the risk of deploying poor-quality software into production. Continuous delivery helps automate deployment processes to improve speed and quality. Application management helps eliminate application-performance blind spots, with continuous feedback.